This high-performance .380 ACP load uses 90 grain jacketed hollow point bullets and achieves above-average muzzle velocities of 1000 feet per second. 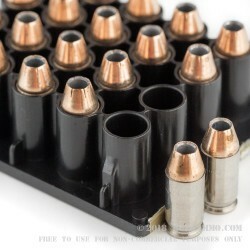 Each cartridge is cased in reloadable nickel-plated brass. Historically considered marginal for self-defense, .380 ACP / 9x17mm Short cartridge and the concealable pistols chambered in the cartridge have benefited enormously in recent years from modern bullet designs such as the Hydra-Shok. 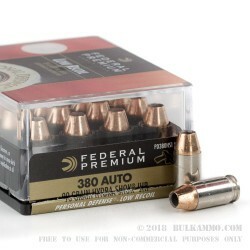 Made by Federal, Hydra-Shok jacketed hollow points offer strong penetration and expansion and represent a massive improvement over full metal jacketed ammo in the .380 ACP. A post in the center of the bullet's cavity provides for fast and reliable expansion in targets, minimizing the chance for pass-through and collateral damage. 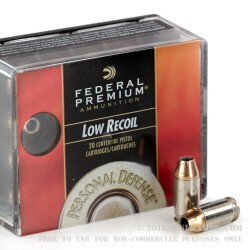 Federal Premium Ammunition, founded in 1922, is one of the nation's top ammo manufacturers. In addition to supplying ammo to the US armed forces as the operator of the Lake City Army Ammunition Plant, the company manufactures a wide variety of cartridges for personal defense and target shooting. 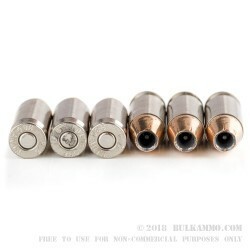 Its Hydra-Shok and HST rounds represent major innovations in the field of jacketed hollow point ammo and have found favor with CCW license holders and police officers across the country. Q: I carry a .380 and was wondering what are the pros and cons of using this product over the cheaper .380 ammo? Posted On: 10/21/11 By: Nikki H.
A: This Federal Hydrashok is some of the best ammo you can buy for a .380 when it comes to personal defense. It retains weight well, expands reasonably and penetrates deep enough to reach vital organs, which many .380 JHP loads cannot do - many suffer from inadequate penetration.